It turns out that chickens love snuggling as much as the next critter, and some can be pretty vocal about it. 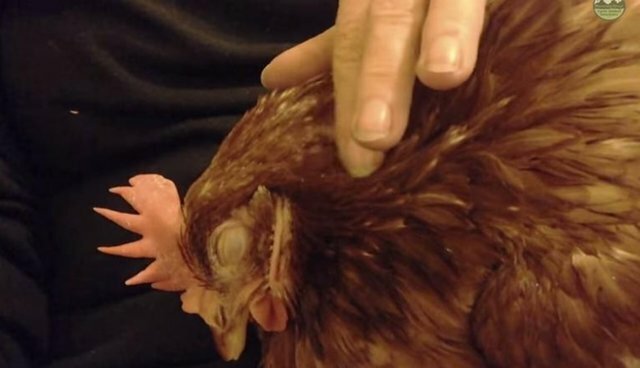 A happy chicken is cuddled up on a human's lap and purring away like a cat in this video, uploaded last week by the Manning River Farm Animal Sanctuary in Kimbriki, Australia. The sanctuary is "a place where ex-farm animals can live out their lives in a safe & loving environment free from harm & human exploitation," according to its website. That means that this snuggly chicken will get all the love and lapsitting she wants, and she can keep purring to her heart's content. First snoring, now this! These happy chickens are doing their part to show the world that you don't have to be furry to be cute - you can do it in feathers too. Most chickens never get the chance to relax on a cozy lap, as the U.S. raises more than 8 billion chickens a year for slaughter. Chickens raised for meat or eggs are often kept in horrific conditions, sometimes living their whole lives in one cage. But concern for the welfare of farm-raised chickens is growing, and this video is another step toward acknowledging chickens as deserving of love and comfort. Especially if it's going to make them purr with happiness!